The first order of business when the Settlers landed in Algoa Bay was to establish some sort of permanent roof over their heads. As such, schooling was not a priority. Nonetheless the residents desire for schooling for their children could not be trifled with. To this end, a meeting of the inhabitants was arranged for Friday 20th February 1824 at the Red Lion Tavern which was by then being used as the Custom’s House and as Public Offices. With Captain Francis Evatt in the chair, the meeting at the Red Lion Tavern drew up a memorandum to the Governor requesting that a church and a school be built. In reply, the Governor promised a school but rejected their request for a church claiming lack of funds. Beyond the hackneyed verbiage of “civic responsibility” and “solidarity,” a rich well of these attributes was displayed when this minute impecunious community had by August 1826 provided what was termed, a “sufficient” school, in the turgid language of the report. In reality this amounted to no more than a prefabricated wooden building. The exact location of this building cannot be ascertained. 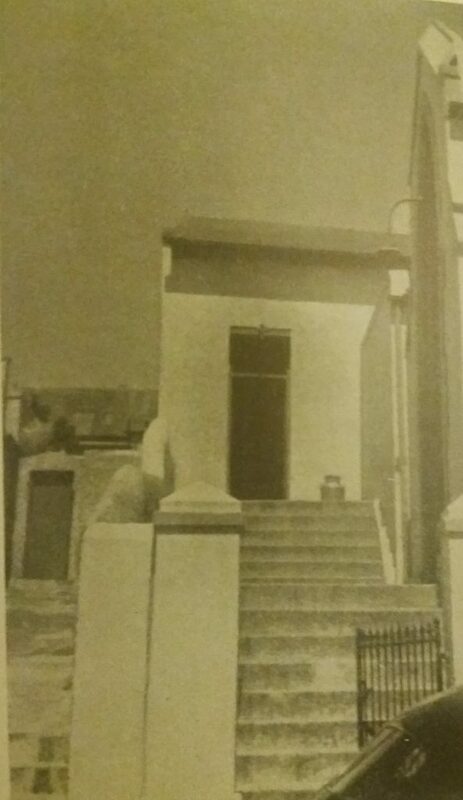 Despite a grant of land for a future school being made on 13th September 1822 of a site on the corner of Belmont Terrace and Western Road, this begs the question whether this temporary structure was itself located on this site, given the fact that this area was desolate and far from the homes of the children. It is more likely that this temporary accommodation was located somewhere on the foreshore. Having met their part of the bargain, the residents requested that the Cape Government provide a schoolmaster. In the interim, a Corporal of the 55th Regiment was graciously acting as a temporary teacher to approximately forty children. Finally, on the 28th November, the appointment of a teacher was sanctioned. According to various directories, the school, known as the English Free School, had various Masters over the succeeding years: J. Stephenson in 1830, Richard Lamont in 1832, W. Dely in 1833 and J. Walker in 1834. Whilst providing the names of the successive Masters, none divulge why there was such a rapid turnover of staff. One can imagine that the large class sizes and multiple grades taught simultaneously could have been contributing factors. In order to augment his income, Rev. McCleland, the clergyman at St Mary’s Church and owner of 7 Castle Hill, decided to start a small school sometime during 1831. Being an era before females were encouraged or even permitted to attend school, this school would be reserved for boys only. Presumably it was not located in one of the bedrooms of the house, but rather housed in premises close to the current St Augustine’s Church. The undersigned is of the intention to open a Day School for a limited number of pupils whose parents may be desirous of giving them a Classical education and some knowledge of Mathematics, Composition, Geography, History etc. As the higher branches of learning will alone be attended to, the School will be open from 10 to 1 o’clock each Day (Saturdays excepted), so that the Pupils may have an opportunity of acquiring a knowledge of the Minor Branches of Education from other schools established in Port Elizabeth. The want of a Classical School upon the Frontier has long been felt and acknowledged but Parents wishing to have their Children prepared for the Universities of Oxford, Cambridge or Trinity College, Dublin, can avail themselves of the facilities now afforded. Terms: Twenty Pounds Sterling per annum to be paid quarterly and three Pounds fifteen shillings entrance. Pupils limited to TEN but the school will be opened when it is notified that six will come. What is not known, as this advertisement does not clarify the issue, whether the school caters for Elementary pupils or whether it was a senior school. That said, implicit in the words “prepared for the Universities of Oxford, Cambridge or Trinity College” is that this must have been a senior school. 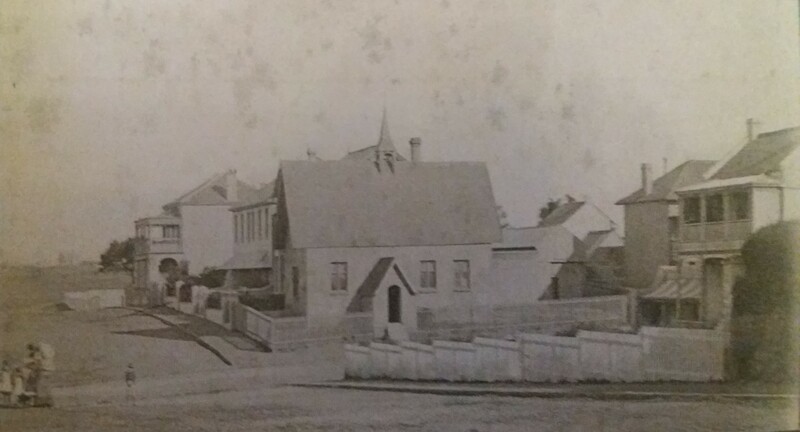 In the early days, a Government Free Elementary School, entirely multiracial, had been established in a small building adjoining the Coloured Union Chapel, founded by the Reverend Adam Robson, located on the corner of Chapel and Victoria Streets. Could this be the school that the residents, under the chairmanship of Captain Francis Evatt, had petitioned the Colonial Government to provide in 1824? In due course, the need for a Senior School also had to be addressed. Twenty years after the arrival of the Settlers, the burgeoning town still did not possess such a school. During 1839 a number of teachers were “imported” from Scotland by Dr. Innes, the Superintendent-General of Education in the Cape Colony. Amongst this “classroom” of teachers was a certain Mr John Paterson, who would assume the headship. Both had graduated at the University of Aberdeen. 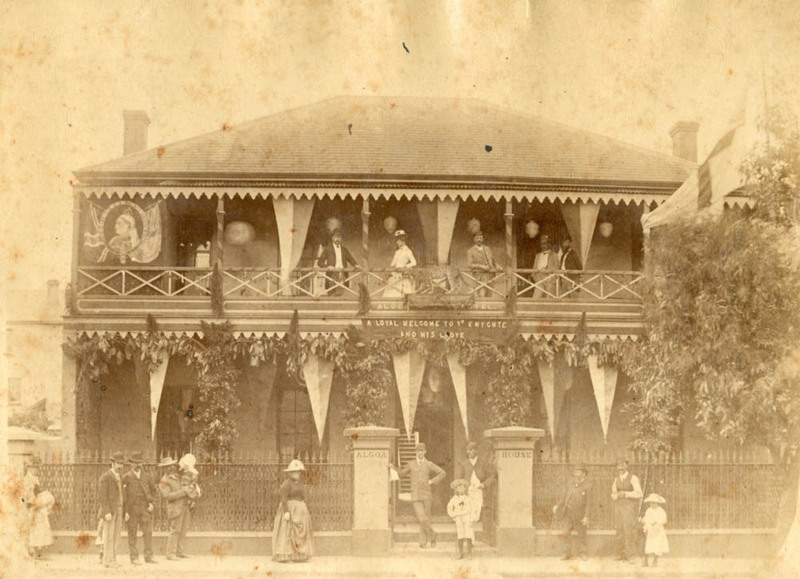 During July 1841, a new era was ushered in for schooling with the opening of Port Elizabeth’s first senior school, the Free Government School, with John Paterson as the Master. This school house, belonging to the London Missionary Society, was located behind the Union Chapel Church in Chapel Street. It was rented by the LMS to the government for the modest sum of £40 per annum. Paterson’s salary was fixed at £150 per annum together with a stipend of £40 per annum as rent for his house on Chapel Hill. Assisted by an “usher” who received £15 per annum, Mr Paterson taught upwards of 150 pupils single-handedly. 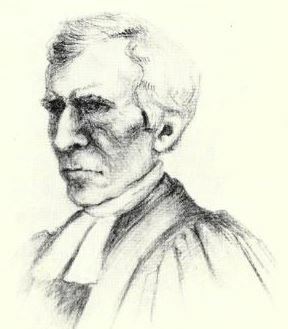 Undaunted, Mr. Paterson attended to his duties with “great zeal and determination.” By 1845, he was granted the assistance of another master, the Rev Francis McCleland, the clergyman at St Mary’s Church. Given the fact that his remuneration was a meagre £15 per annum, one must assume that he was only employed in a part-time capacity. When he was replaced by J. Kemsley two years later, his stipend amounted to £30 per annum. Amongst Paterson’s most prominent pupils were William and Charles Fleming, Frederick Chase, Charles Lovemore, J.L. Burchell, John and George Owen Smith and J.C. Kemsley all of whom made their mark on the town. Ironically Adelaide McCleland, the daughter of the Rev Francis McCleland, and my second great aunt, married William Fleming, an extremely successful businessman in early Port Elizabeth. Given the milieu in which they operated, all Government Schools admitted boys only. Girls, if they were educated at all, attended private seminaries or were taught at home by a governess. The basic aim of schooling was to make boys literate and numerate thus enabling them to manage their daily lives and serve apprenticeships. Further teaching enabled a boy to find a place in an office. Without more advanced facilities, boys intending to prepare for the professions, were usually sent overseas. Paterson’s sojourn at the school was never bound to be long. An entrepreneur at heart, Paterson soon was casting around for new adventures. Editing a newspaper initially became a sideline occupation. This situation ceased in January 1848, when an acquaintance, Joseph Reid, who had come to the Cape with Paterson in 1841 succeeded him as Master at the FGS. In the interim, Reid had been a Master in Somerset East and George. John Paterson was now free to perform his duties as editor of the Eastern Province Herald full-time instead of surreptitiously. Gradually the Government Free School had deteriorated down the years, both in tone and content, no longer attracting the better type of teacher. Nevertheless, it was still patronised by black and white pupils whose parents were of the poorest working-class and quite unable to afford any kind of fees. Both races shared the same classrooms and playground while books and slates were provided free by the authorities. Whereas once the Government Free School had been deemed fit for the education of the offspring of the early settlers, it was now regarded as suitable by the wealthier rising generation of segregationists. Finally, I cannot ascertain when this school finally closed its doors. In all likelihood, it was replaced by the Grey Institute over time for white pupils and probably Coloured student numbers declined as the Coloureds were relocated to the multiracial suburb over the Baakens. Harriet Eedes was either passionate about the education of females or alternatively required a profession to generate income. Whatever the rationale, she rented a property, named Algoa House, located in Western Road, from Mr. Jonathan Board for use as a school for young ladies. This school is listed in the 1843 edition of the Cape Almanac as Mrs. Harriet Joanna Eedes’ School for Young Ladies. In 1845, Eedes advertised that she was re-opening her boarding school in Grahamstown, where she rented the house The Retreat. It is assumed that at this point, this school in Western Road was closed and the property reverted to residential accommodation. Founded in the 1850s by the Anglican Bishop, Robert Gray, and designed by his wife, it was located at the corner of White’s Road and Belmont Terrace. This ecclesiastical-looking building was known as St. Mary’s or the Diocesan Grammar School. 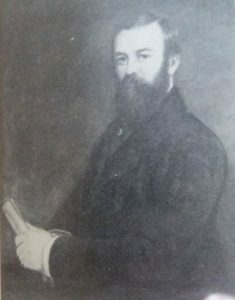 Initially the school had prospered as the fees from its fifty well-to-do, opulent even, pupils were sufficient to finance a headmaster, Mr. Hardwicke, and three teachers. Unanswered is the reason why a school was established less than a block away from the Grey Institute located in Belmont Terrace. Prophets of doom probably bet that both schools would not survive within such close proximity. Saturation of supply of schools might not have boded well for its existence, yet its initial demise was unrelated to this reason, but rather due to human nature. Apparently, this closure circa 1870, orchestrated by Bishop H. Cotterill, arose due to some difficulty regarding the salary of the headmaster, Hardwicke. Intersection of Belmont Terrace and Western Road. The houses on the right in Belmont Terrace were ultimately demolished to make way for the King Edward Mansions. Across Western Road on the right was the plastered building of the Diocesan Grammar School. The vacant building was then leased as a synagogue to the Jewish community. This lease was only cancelled in 1878 when the local Jewish community commissioned their own synagogue in Western Road. 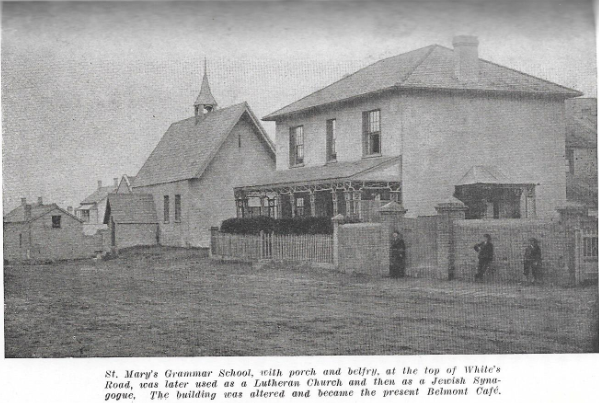 Defying expectations, the Grammar School was reopened at Easter 1878 by the Reverend A.T. Wirgman, who ran it until June of that year, when the Reverend Alexander Grant was appointed as headmaster. This was not a false dawn, as under Grant’s charge it grew rapidly and flourished as a rival to the Grey Institute. Later it was taken over as an Art School, at which the Collegiate girls attended art classes. Today the building, somewhat altered, is occupied by the Belmont Café, but the windows of Gothic design point to its origin as a church school. St Mary’s Grammar School. Later used as a Jewish Synagogue. Now the Belmont Cafe. Not without cause was the education of females regarded as futile. History’s verdict would ultimately be damning on this score but during this Victorian era, they were debarred from all professions and most careers. Hence only a knowledge of the three Rs was considered sufficient as well as a smattering of music, singing, dancing and needlework. Tellingly, before the era of the female franchise, among the activities deemed to be outrageous was public speaking. School uniforms had yet to come into existence. Not to be trifled with was the unspoken dress code of high-necked blouses with long sleeves, whilst skirts and dresses were so long that to show any part of the leg above the ankle was considered immodest and almost immoral. What this meant in effect was that there was a “school uniform” albeit that it was not officially imposed but rather societally sanctioned. A starched white pinafore kept the girl’s frocks clean. Even in later years when girls were allowed to indulge in sports such as cricket, hockey and tennis, the same long cumbersome skirts were the order of the day. For swimming, a frilly cap kept the hair dry while a black or striped costume covered the body down to the knees. Furthermore, at all times swimming for the girls was segregated from the males. From a societal perspective, females were considered not to possess agency during this era. Yet the tortuous pace of change would ultimately usher in the female franchise in the first quarter of the 20th century culminating in women’s emancipation under the banner of Women’s Liberation during the tumultuous nineteen sixties. Change in the schooling of females was in the offing. There was no specific defining moment, epiphany or a “Road to Damascus moment.” Rather it was the convergence of two – not diametrically unopposed – veins of social movement. Firstly it was the diversity of types of boys and girls – presumably from a class perspective – attending the sprinkling of mixed schools in the town. Conflated with this, was the surging affluence due to the increasing wealth of a great number of the residents, that engendered the widening social class distinction. 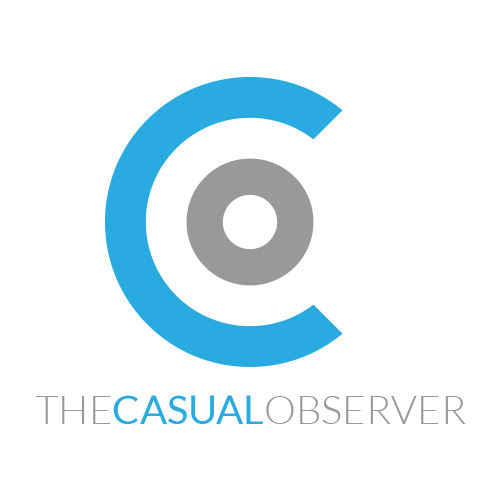 This phenomenon was not dissimilar from the burgeoning racial division arising in Port Elizabeth as a result of low class whites being elevated from the blue-collar working class to the white collar professions and occupations. 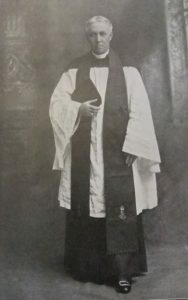 Amidst the backdrop of social change and in order to redress these perceived social defects, private “Young Ladies’ Seminaries” sprang up to address this latent demand. These seminaries were rapidly patronised by the daughters of the well-to-do families who were exclusively White. Ironically ushering in this new era, were ladies who were neither trained nor qualified as teachers. Most of them were widows in an era where most careers and jobs were restricted exclusively to males. This is not to say that these dedicated ladies were incompetent rather that they were expected to inculcate values which they possibly did not possess. Take the case of Mrs. H.J. Sherman who ran her seminary from No 1 Cora Terrace, just off Bird Street where she catered for day scholars and boarders. Probably acknowledging the limitations of the existing instructors, she obtained the assistance of Professor Gundelstrap and Fraulein Nutschonto to provide afternoon classes for private pupils, who received instruction in French, German, music, drawing, illuminating and fancy needlework. Another popular day and boarding-school for girls was that of another widow, Annie Sandford, at Rockcliffe House to which access was gained by a long flight of steps from Russell Road. Meanwhile, Mrs Mary Ann Lambert ran her school from No. 3 Pearson Street, assisted by a Miss McCleland, one of my second great aunts. Whether this was Margaret or Georgina McCleland, I have not been able to ascertain as both never married but led full and active lives. Faced with limited career prospects, like all females of this era, together they ran a private school in Port Elizabeth for many years. In the McCleland family history, they are referred to the “two old maiden aunts in Wynberg”, having relocated there later in life. Apart from these seminaries mentioned above, there were various others such as Mrs Louisa C. Bonny who ran her ladies’ seminary at 15 Constitution Hill. Despite these entrepreneurs’ commendable efforts, most of these schools only catered for an extremely limited number of pupils due to their limited capacity. As Bob Dylan would croon a century later, “Times are a-changing” which would arise from a surprising source. Mrs Phillipson created a private school at No. 15 Western Road, where the first Collegiate would soon be established. Her husband, William, was about to retire having sold his very lucrative ginger-beer factory in South Union Street to a friend, Alfred Smith. They decided to close the school at the end of 1873 and relocate to a more pretentious homestead at No. 1 Annerley Terrace, a very select area. This would set in motion a train of events which would culminate in the establishment of the Collegiate School. This also represented an opportune moment to relook at the need of a high school for females. Parents who could afford it, were obliged to send their daughters to schools in the larger towns in the Colony whereas others chose to send them to be educated in England. It was at this juncture that the need for a high school for girls came to the fore. Port Elizabeth was now ripe for the establishment of a proper senior school. But first it would be the turn of a proper boys’ school. In due course, building of the Grey Institute would commence on the 17th January 1856 when the foundation stone was laid. The girls would have to wait for almost another 20 years.